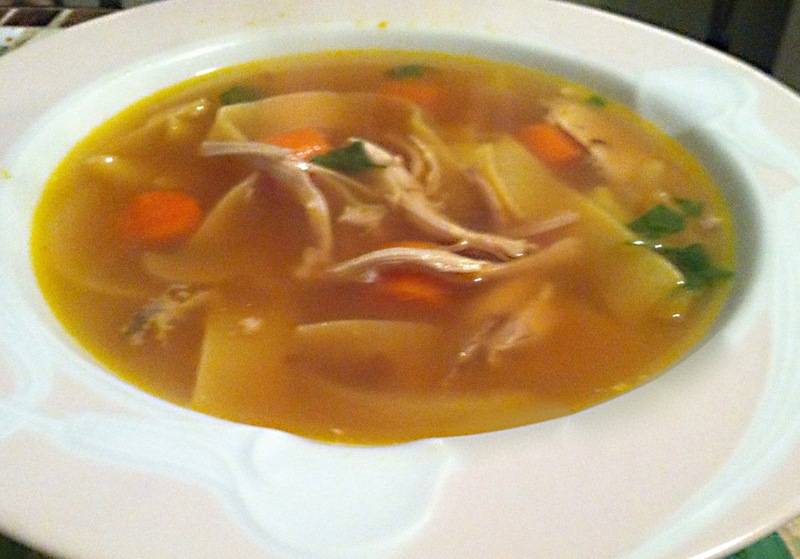 When I am sick, I crave chicken soup. But nothing is worse than cooking up a storm while your head feels like it’s going to explode. Instead of reaching for the canned stuff, whip together this improvised recipe and you’ll feel better in no time. Makes eight servings. Freeze leftovers for emergencies. 1. In a very large pot, heat canola and butter. 2. When butter is melted, add carrots and onion. Sautee until carrots are softened, about 10 minutes. 3. Pour in chicken stock, then add a quart of water. Stir in chicken, then season with salt, pepper and garlic powder. Cover and let simmer for ten minutes so favors meld. 4. Raise heat and bring to boil. Add noodles, then reduce heat slightly and cook until noodles are tender. 5. Stir in herbs, then ladle into bowls. Serve with crackers.